An irresistible invitation: To Those Who Appreciate Wisteria and Sunshine, a Small Medieval Italian Castle on the Shores of the Mediterranean to be Let Furnished for the Month of April. 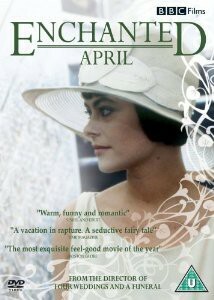 Four ladies, previously strangers to one another, answer the call to escape to Italy for one glorious Enchanted April. It is 1920s London, and the dreariness of unfulfilling routine contrasts starkly with the promise of a brightly-lit, languid holiday in the countryside. It doesn’t take long in this restful place for the visitors to shed their cares, form new friendships, and rediscover the beauty in both themselves and their other lives. Be inspired by a welcome respite and a fresh perspective, even if your own getaway is simply a vicarious one.